Are you thinking about whitening your teeth? At Freedom Dental, we use the latest Philips Zoom WhiteSpeed technology that can whiten teeth by up to eight shades while protecting your teeth enamel. Our team have been providing Philips Zoom teeth whitening treatments in Melbourne and across Australia for over six years, and have been trained by Philips Zoom to deliver these treatments safely and effectively. In fact, our dental spa has been Australia’s largest Philips Zoom provider since 2012. To celebrate our achievements, we are able to pass on our best prices to you. See below for our lowest teeth whitening prices that we have ever offered. Prices for Philips Zoom Whitening in Melbourne commence at $195. Find out whether you’re a candidate for Philips Zoom teeth whitening and discuss your treatment options by making an appointment with Freedom Dental today. We respect your busy lifestyle, which is why we can schedule appointments during our extended opening hours and on Saturdays too. Scroll down or click here for some of our commonly asked questions about teeth whitening. 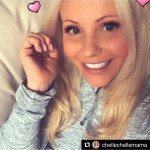 Some of our actual patients showing off their new whiter smiles on Instagram! Freedom Dental are one of the most experienced providers of the Philips Zoom Whitespeed teeth whitening system in Melbourne. We have reduced our prices for teeth whitening services. Please see below. Our team of professionals will create a custom fit teeth whitening tray for you. You will also receive 3 whitening gels. Trust the professionals. We offer the latest Philips Zoom Whitespeed, you can achieve your maximum whitest smile with just one 45 minute teeth whitening treatment. * Suitability of tooth whitening will be determined on a case by case basis. We recommend a dental examination and clean prior to treatment. * To secure your brighter and whiter smile, a $200 deposit is required at time of booking. As a courtesy, 48 hours notice is required to alter an appointment. Cancellation of an appointment within this time results in forfeiture of your deposit. Saturday appointments available. * White4Life Terms and conditions: To be eligible, a patient must mention this offer upon booking. Patients may require an oral hygiene appointment before undertaking whitening treatment. Any dental services required prior to undertaking this offer will be at the patient’s expense. Offer cannot be used in conjunction with any other offer, is non-transferrable and non-redeemable for cash. Offer includes 1 x in-chair whitening treatment, custom trays, 1 x top-up whitening kit on the initial appointment and 1 x top-up whitening kit on every subsequent 6-month dental check-up and clean appointment. If the patient does not maintain their 6-monthly oral hygiene appointments, they forfeit the program. Due to the changing nature of a patient’s oral health, Freedom Dental reserves the right to deny a patient whitening treatment if the changing nature of the patient’s oral health deems the patient unsuitable for whitening treatment at any stage. Prices may be subject to change. Cosmetic treatments may not be claimable through your health insurance, please speak to your health fund to confirm. Not all patients are suitable candidates for teeth whitening, and results vary for each individual. Please contact Freedom Dental to discuss your eligibility for teeth whitening and what results may be achievable for you. Any surgical or invasive procedure carries risks. Before proceeding, you should seek a second opinion from an appropriately qualified health practitioner. Teeth whitening is one of the most popular cosmetic dentistry treatments in Australia. It can be used to whiten teeth that are stained or discoloured, lightening them by several shades for a whiter-looking smile. Zoom WhiteSpeed professional teeth whitening is performed at our dental clinic under the supervision of your dentist. This system has a variable intensity setting that allows each treatment to be customised for the individual patient’s needs, as well as desensitisers to help protect your teeth, help reduce sensitivity and improve comfort. In many cases, the treatment can be completed in just one hour. Your professional whitening treatment is carried out by our dentists in the comfortable surroundings of our Melbourne dental clinic. After we’ve examined your teeth and gums to check that they’re healthy and confirmed that you’re a good candidate for teeth whitening, we will explain what the procedure involves and what the risks are, so you can decide whether it’s right for you. Before your treatment begins, we’ll place a rubber shield or gel onto your gums to protect them. We’ll then fit a custom-made tray over your teeth that contains the whitening agent, including the active ingredient hydrogen peroxide or carbamide peroxide. This active ingredient breaks down and allows oxygen to enter the enamel surface of your teeth and brighten them. This bleaching process is accelerated using the Zoom Advanced Power Chairside Lamp, and a fluoride gel will be applied to your teeth afterwards to help reduce their sensitivity. This process will normally be repeated three to four times during your whitening session, which should last around one hour. Some practices only offer two cycles. Our team will help you to relax during your treatment by playing your favourite music or Netflix, Foxtel or DVDs on the ceiling-mounted TV. You may notice results straight away, but it will normally take a little longer for your teeth to reach their full whiteness. We’ll provide a take-home tray that you can use to top up your smile if it fades. 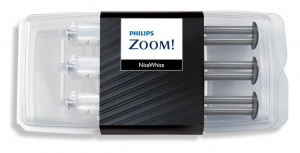 If you prefer to whiten your teeth in the comfort of your home, we can provide Philips Zoom DayWhite and NiteWhite Whitening Systems. These treatments produce more even results compared to other home whitening methods. They’re also the only take-home products that contain amorphous calcium phosphate (ACP), which helps to reduce sensitivity for a more comfortable treatment. Our dentists will take an impression of your mouth so we can produce a custom tray that fits over your teeth perfectly. We’ll instruct you on how to use the product safely and for the best results. Your teeth should reach their desired shade in between 7 and 14 days. Find out more about home teething whitening. Teeth whitening isn’t a permanent treatment. We’ll help you to schedule repeat treatments or provide take-home kits if you want to maintain your white smile. How long whitening lasts can vary from person to person, but most Zoom teeth whitening treatments last for six months or longer. You can help your teeth to keep their whiteness by avoiding common sources of stains and taking good care of your oral hygiene. What are the risks associated with professional whitening? Most people won’t experience any negative side-effects from teeth whitening. However, some people experience sensitive teeth and gums or a sore throat for a short time following their treatment. If these symptoms last for more than a few days, you should make an emergency appointment to see your dentist. We won’t recommend these treatments if you’re pregnant or if you have a health issue that could put you at risk. We also recommend that you avoid tobacco and stain-causing food and drink, as this can affect the outcome of your treatment. Find out more about teeth whitening at Freedom Dental by coming to a free information session. You’ll have the chance to ask our team any questions and to find out everything you need about our treatments and our dental clinic, so you can make an informed choice. Click here for terms and conditions. Any surgical or invasive procedure carries risk. Before proceeding, you should seek a second opinion from an appropriately qualified health practitioner.